for girls and the special men in their lives. 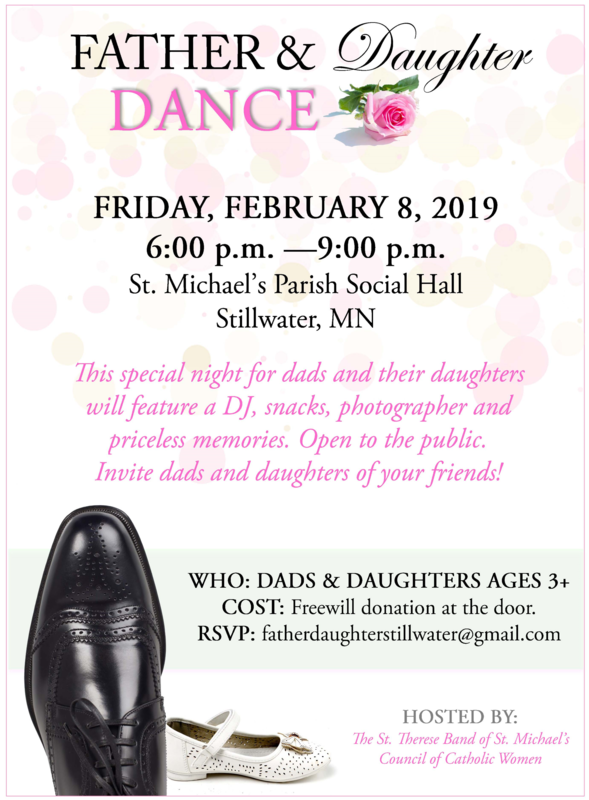 The Church of Saint Michael is excited to host the first annual “Father Daughter Dance” on Friday, February 8 from 6:00 - 9:00 p.m. The event is open to girls ages 3+, offers a great opportunity for fathers and grandfathers to spend quality time with their daughters. A DJ, will keep the dance floor rockin’ with hits from both dads' and daughters' generations and crowd favorites like the Hokey Pokey, Chicken Dance, Electric Slide and the Limbo. The cost is a free will donation which will help cover the expense of the event. Take a souvenir photo at the photo booth, enjoy complimentary dessert, and simple craft. Create priceless memories! To register or for more information on the Father Daughter Dance, email fatherdaughterstillwater@gmail.com.